Super exciting news! 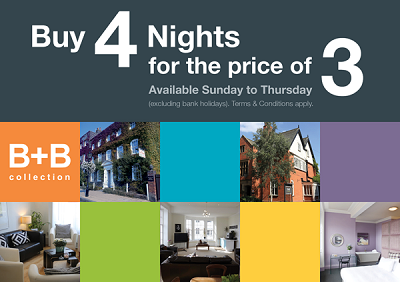 Due to popular demand we decided to extend our 4 for 3 offer across all B+Bs*. Enjoy 4 nights at B+B for the price of 3. Book today via phone or email directly with any of our B+Bs. Hurry up while the rooms are still available! Offer is available for bookings Sunday to Thursday only. The following dates are excluded: 30/03/18-2/03/18, 1/06/18-31/08/18; 21/12/18-31/12/18 and all bank holidays. Rate is payable at the time of booking and is non-refundable, non-changeable and non-transferable. Not available in conjunction with any other special offer or rate. Room reservations must be made directly with the hotel, via telephone or email. Cannot be redeemed against cash or any other services. B+B Collection cannot guarantee the availability of your chosen date, in this case we will inform you and you will have the option of free cancellation. Additional charges may apply (for example, extra beds etc. ).